At least one of the German Left 4 Dead covers features an edited hand — complete with extra finger. Japan is getting not one, but two edited covers. 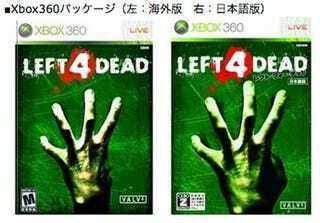 Both the Japanese Xbox 360 version and the PC version of Left 4 Dead are shipping with edited covers. The Xbox 360 version (above) has an edited finger, while the PC one (below) features a "Best of E3" label over the missing digit.